My husband has been ordering beet and goat cheese salads from every menu in town. Seriously, whenever we go out, this seems to be his go-to salad, and for good reason. It’s good! Beets will forever remind me of my father. He loved them and made them fairly often. I don’t recall exactly how he served them, but I do remember trying them as a child and being pleasantly surprised at the taste. I also remember being afraid to try them probably because you don’t hear of too many kids who go gaga over beets. I’d encourage you to give these a try if you’ve never had them. 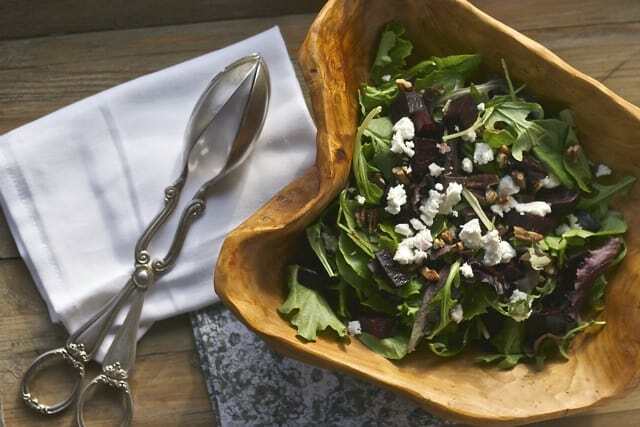 This salad combines goat cheese with the roasted beets and toasted walnuts. The flavors are wonderful together as are the various textures that include crunch, crisp, and creamy. 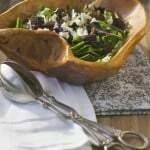 The walnut vinaigrette was a nice change from the norm and is fairly easy to make. I added all my ingredients to a small plastic squeeze bottle and shook it to combine. This salad would look great on your holiday table. I especially love the colors for the Christmas season. Place beets on sheet of aluminum foil and make pouch to seal beets inside. Place in oven on top of cookie sheet and bake for about 40 minutes and then remove and continue to allow beets to steam inside pouch for another 10 minutes or so. 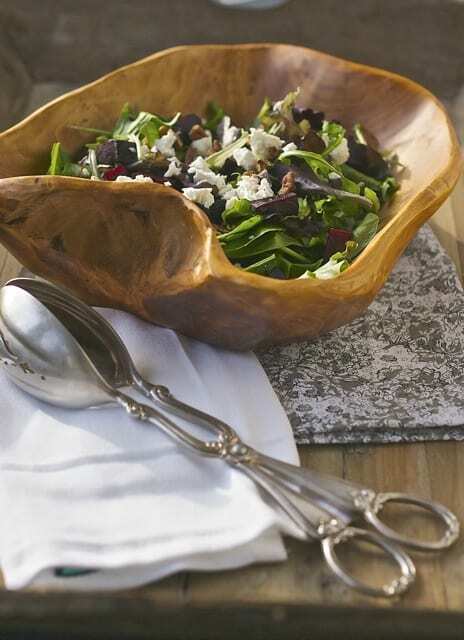 Mix beets with 1/2 of the salad dressing and use the remaining dressing to dress the greens. Transfer greens to plates and top with nuts and cheese. I’m a little nuts over beets – I go through phases where I want to eat them every single day…much to the chagrin of the rest of my family. Hey, more for me ;P This salad sounds fantastic, I need to try it. Same here – I am trying to eat more salads and vegetables in general. Sometimes I’m more successful than other times!